I haven’t read the book of the film and for the most part haven’t been paying much attention to the various headlines it’s been grabbing during production so I sat down a little too early on a Sunday morning to check this out from scratch. The film tells the tale of Pitt’s former UN inspector (not a position usually feted in leading man parts), now living a quiet life making pancakes for his family. Evidently the retirement scheme for former UN inspectors pays well. This tranquillity lasts a pretty fleeting amount of screen time though and on what looks to be the worst school run in movie history, all types of zombie hell breaks loose. Brad and family end up legging it to the sanctuary of a US aircraft carrier thanks to some pretty handy contacts in his mobile. Once aboard the vessel, Brad is given a pretty stark choice by the commander - either save the planet or we’ll ditch your family at a distinctly unsafe refugee camp. Harsh, but then, this is the apocalypse. World War Z grabs you right from the outset and just does not let go until Cardiff. The opening credits (complete with pumping Muse soundtrack) hint at things amiss around the world and from the minute things start going bang in the street, you’re thrown into some of the most nerve shredding tension we’ve witnessed for a while. Argo did tension well, World War Z does it well and does it for just slightly longer than you think you can stand. By Cardiff, you’ll be exhausted. The first ‘attack’ (for want of a better word), is a spectacular assault on the senses and rivals pretty much anything we’ve seen for sheer exhilarating carnage. The brutality of the family’s treatment once on board the aircraft carrier is a nice change. Pitt’s Gerry Lane isn’t acting out of patriotism or any real heroism - he simply has no choice if he wants his family to stay safe. And the film doesn’t just drop the family off and forget about them, we’re constantly reminded about what is at stake as Lane and his wife desperately try to keep in touch as he runs around the globe. Pitt is in relatively unfamiliar acting territory here, this role probably involving more action than a lot of his work but he handles it well. Lane never comes across as a super-hero; Pitt keeps him nicely down to earth no matter what is thrown at him. Mireille Enos makes a confident step from the American version of The Killing and does well in a role that could easily have been side-lined. 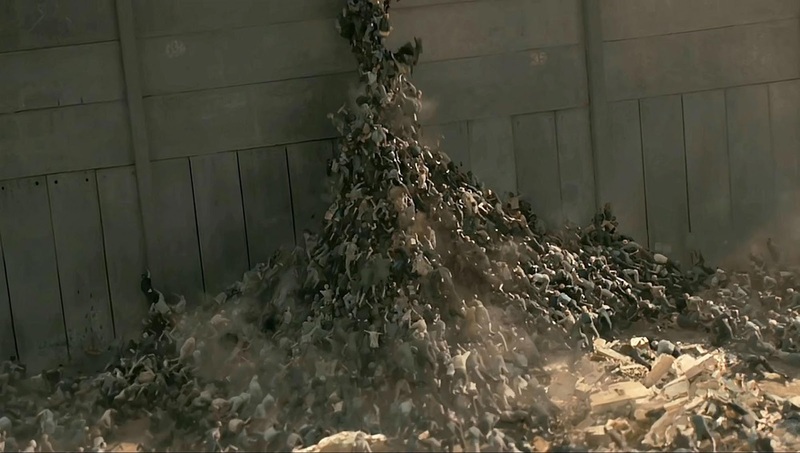 As far as actual zombies go, World War Z doesn't really deal with them so much as just throw thousands of them at you. These zombies can run faster than you can and they’re not interested in eating you (something that I’m sure helped keep the American PG-13 rating - there is next to no gore or even blood in this film), they just want to bite you to spread the plague. The closer these guys get, the less scary they become, the fear is very much in the horde – the approaching wave of zombies, preceded by unnatural shrieks is quite an experience. Which brings us to Cardiff. Oh Cardiff. Lane’s search for the cure takes him on a whirlwind tour of the world and lands him (pretty roughly) near a WHO facility in Cardiff. Which is where the film splutters to a halt. Confined to a medical facility for the last act, the film has none of the tension and sheer terror of the horde, we’re left with a sort of Dr. Who-esque run through inexpensive set corridors and some very random injection experimentation. The other characters in Cardiff are reduced to standing around commentating on Lane’s actions as they watch him on CCTV monitors. The ending is as open as it could be given the set-up but left us feeling underwhelmed rather than desperate for more. This is a shame because up to Cardiff, World War Z is a fantastic, entertaining, nerve-shredding summer blockbuster. Forster has done a great job with his FX and sound teams to build a terrifying vision of a world slipping into the abyss, pursued by an unrelentingly vicious horde. I suspect my enjoyment was improved by never having read the book, not being a zombie aficionado (I have no issue with sprinting zombies that don’t eat you) and not really being desperate to see intestines in a zombie film. There are plot holes but none that we’d spend time chewing over because for us, World War Z delivered on its promise. Just don’t mention Cardiff. Check out the World War Z trailer here.